Working out while working from home - Am I Hungry?Am I Hungry? I have a dream job: sharing my passion and living out my purpose – all while working from home. I also love the short commute and the lax dress code. My husband came home from work one day and asked, “Was it casual Friday?” I looked down and realized that I was still in my pajamas! This last one came as a bit of a surprise to me. I love to hike and/or do yoga most days of the week so I felt like I was getting enough exercise. However, after leaving my private medical practice, I gradually put on a few pounds. As I look back, I was on my feet, moving from room to room seeing patients and back and forth to my office. As I always say, the little things really add up. I pace or walk around my house during phone meetings; my dog thinks it’s odd but it keeps me engaged and helps me think. I need to get a big exercise ball to sit on while at my computer; I think that’s a wonderful idea. 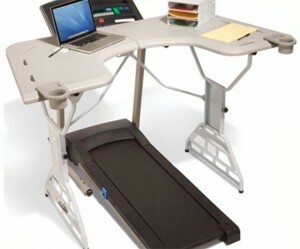 And I would love to have a stand up desk. I sometimes stand at my desk at my part time job and like it very much 🙂 Thank you for the ideas!